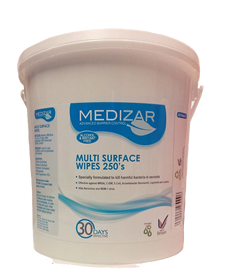 MediZar® Anti-Bacterial / Anti-Microbial Hard Surface Sanitiser Wipes are certified to kill deadly E.Coli & MRSA within 30 seconds, and will kill 99.9999% of all bacteria, viruses etc which cause workplace and Hospital Acquired Infections. 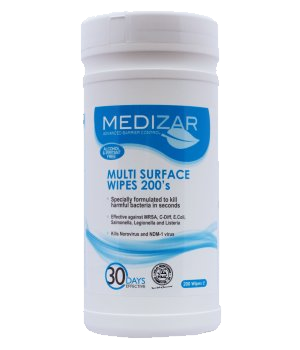 With Advanced Barrier Protection these effective, ecological cleaning wipes will cut through surface deposits such as grease and proteins - killing germs and reducing re-contamination. 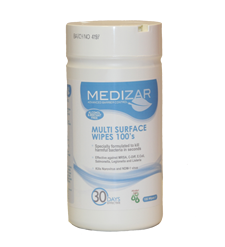 To use simply wipe over the area to be cleaned – MediZar® hard surface sanitiser wipes will continue to offer 100% protection for up to 30 days even when dry against tested bacteria.